Yesterday, we looked at a particularly foul and nasty installment, Page 167, at the request of Mary Pacios. Today we’ll do Pages 197-198 at Mary’s request. I hope you are ready for a shocker. Even for Donald H. Wolfe, this is nasty, nasty work. A ruthless, conniving, calculating and cynical attempt to pull off a fraud. You are so busted, Donald H. Wolfe. To the haz-mat pile of Dahlia books…. Page 196 is about organized crime in Los Angeles: Jack Dragna and Bugsy Siegel. And there’s a lot of mumbo-jumbo and Brenda Allen, Mickey Cohen, the mob assassination of Paul “Paulie” Biggons, blah blah blah. Now this is just Wolfe being nasty for the sake of being nasty. I would say that for the vast majority of gangland murders in Los Angeles of the 1940s, there was no mystery as to the killers or their motivation. The problem for the police is locating cooperative witnesses, because oddly enough, most people find it unhealthy to testify in court about mob murders. And although publishing capricious and unverified murder accusations against conveniently dead people (oh, say Bugsy Siegel or Dr. George “Evil Genius” Hodel) may sell lots of books, allegations against living people will get you sued. Now I am skipping around so I may have missed the bogus stuff from “Severed” about Elizabeth Short being at the Hollywood Canteen in 1944 and all that rot (note: she was actually in Florida and Boston). And doesn’t Wolfe have her being a prostitute at some point? And then he turns around and makes her into a lazy tramp. I mean Wolfe really doesn’t have a handle on who she was, does he? “When her bisected body was found on Norton Avenue in Leimert Park, it wasn’t mentioned by Capt. Jack Donahoe or the press that her remains were found in the weeds approximately 250 yards from the backyard of Jack Dragna’s house at 3927 Hubert Street, near the corner of Thirty-Ninth and Norton. And then there’s the this memo. Mary asked if Wolfe cut off something important in reproducing it. But first. It’s true the police and the press didn’t mention the proximity of Jack Dragna’s house to the crime scene. As I recall, it’s about five blocks. Dragna’s house, by the way, is still there and fairly modest for a mob chieftain. Luckily, we have Google Earth and Google Maps. So let’s see. Isn’t it weird that Wolfe talks about the distance to Dragna’s backyard? Hm. More like 6½ blocks. Google Maps says it’s 0.6 of a mile. Now look. This is really important. Out of consideration for the people who own the house, I absolutely never give out the actual address of the crime scene. I always say 54 feet north of the fire hydrant in the middle of the block. I have made up an address for Google purposes that’s fairly close to where Elizabeth Short’s body was found. How about a little math? Hm. 1,760 yards in a mile, makes it more like 1,056 yards. So Wolfe owe us 806 yards—nearly half a mile off. This is really funny. Page 375: “Dragna’s address in the 1946 telephone directory place him three short blocks from Thirty-Ninth and Norton [forgetting, of course, that the body wasn’t found there]. 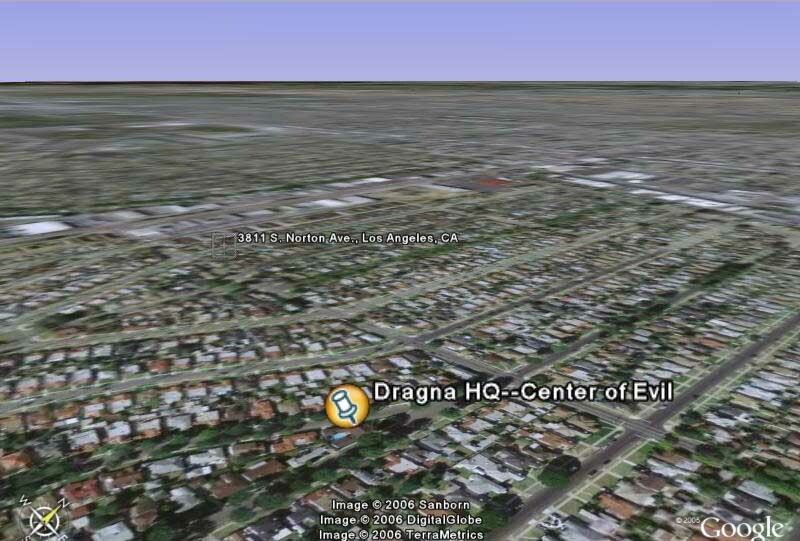 Isn’t it interesting that Dragna’s HQ of evil is listed in the phone book? Like maybe people could call him up ask about the latest mob hits or something. Of course, those of use who have a 1946 L.A. phone book can check. (Thank you, Ebay). Guess who’s not listed. Maybe I should check under Evil, H.Q. Whew. Nothing like wrestling with the technology to get the satellite picture I need. Again, note that I have intentionally fed Google the wrong address for the crime scene. IGNORE it. Now while we’re at it, who else isn’t mentioned by police or the press. Who is it that lives at 3944 S. McClung? Would you believe it? Detective Lt. Paul W. Freestone, the University Division watch commander who was actually at the crime scene. Jack Dragna’s house wasn’t 250 yards or three short blocks from the crime scene. 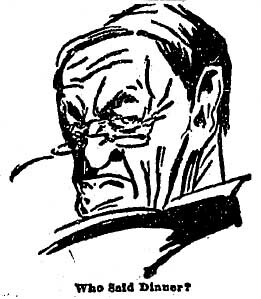 Jack Dragna’s address is not listed in the 1946 Los Angeles telephone directory. Not exactly a good showing is it? Not a real confidence-builder. You know what I like about this paragraph? Did the D stand for Dahlia—or could the D have stood for Dragna? Gosh, I don’t know. Maybe it stood for Donald Duck or Donald H. Wolfe. Wolfe is having fun here because the district attorney’s office won’t let anybody copy the body photographs. I’ve seen them all and I don’t recall anything like that, but then I wasn’t looking for the letter “D” either. So let’s check this memo Mary was asking about. Because I do have that. Gosh, this is kind of hard to find. Weird that it’s not dated. It should be. I’m starting to get a really, really bad feeling about this document. SOME PEOPLE BELIEVED that the “D” cut in the shaved pubic region of Elizabeth Short is of the same type as found on the body of the French woman. [Aha. That explains the reference. Jeanne French]. Facts reveal that the pubic region of Elizabeth Short’s body was not shaved. to determine any type of handwriting from the so-called “D” cut into the pubic region of Elizabeth Short’s body. I’m starting to think Photoshop, folks. Let’s hope I’m wrong. Gosh, it looks like someone lifted the header off an unrelated Oct. 29, 1949, memo from Frank Jemison to H.L. Stanley. Snipped off the inconvenient date and pasted on the material about Leslie Dillon. I’m short on time so I won’t scan in the material today, but you can rest assured, the document produced on Page 198 of “The Black Dahlia Files” is fraudulent and pasted together from two unrelated reports. Would someone please remind me again what a well-researched book this is? I keep forgetting.